If you would like to join in with the Anne Frank #NotSilent campaign, there are a selection of choices available here – replicated below. 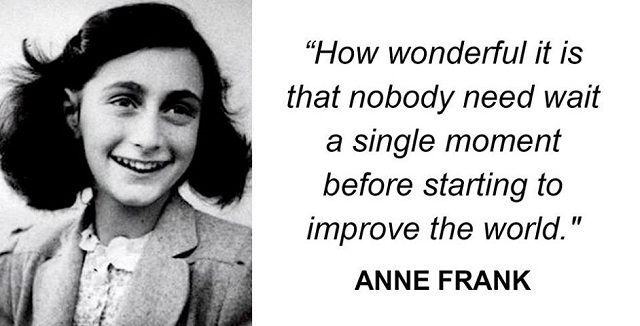 Also, you can visit @annefranktrust on twitter. “I need to have something besides a husband and children to devote myself to! I don’t want to have lived in vain like most people. I want to be useful or bring enjoyment to all people, even those I’ve never met. I want to go on living even after my death! And that’s why I’m so grateful to God for having given me this gift, which I can use to develop myself and to express all that’s inside me! When I write I can shake off my cares. The sorrow disappears, my spirits are revived! But, and that’s a big question, will I ever be able to write something great, will I ever become a journalist or a writer? “I’m becoming more and more independent of my parents. Young as I am, I face life with more courage and have a better and truer sense of justice than Mother. I know what I want, I have a goal, I have opinions, a religion and love. If only I can be myself I’ll be satisfied. I know that I’m a woman, a woman with inner strength and a great deal of courage! “I’ve often been down in the dumps, but never desperate. I look upon our life in hiding as an interesting adventure, full of danger and romance, and every privation as an amusing addition to my diary. I’ve made up my mind to lead a different life from other girls, and not to become an ordinary housewife later on. What I’m experiencing here is a good beginning to an interesting life, and that’s the reason – the only reason – why I have to laugh at the humorous side of the most dangerous moments. “As you can no doubt imagine, we often say in despair, ‘What’s the point of the war? Why, oh, why can’t people live together peacefully? Why all this destruction? The question is understandable, but so far no one has come up with a satisfactory answer. Why is England manufacturing bigger and better aeroplanes and bombs and at the same time churning out new houses for reconstruction? Why are millions spent on the war each day, while not a penny is available for medical science, artists or the poor? Why do people have to starve when mountains of food are rotting away in other parts of the world? Oh why are people so crazy? “One of the many questions that have often bothered me is why women have been, and still are, thought to be so inferior to men. It’s easy to say it’s unfair, but that’s not enough for me; I’d really like to know the reason for this greatest injustice! Men presumably dominated women from the very beginning because of their greater physical strength; it’s men who earn a living, beget children and do as they please… Until recently, women silently went along with this, which was stupid, since the longer it’s kept up, the more deeply entrenched it becomes. Fortunately, education, work and progress have opened women’s eyes. In many countries they’ve been granted equal rights; many people, mainly women, but also men, now realize how wrong it was to tolerate this state of affairs for so long. Modern women want the right to be completely independent! “In the evenings when it’s dark, I often see long lines of good, innocent people accompanied by crying children, walking on and on, ordered about by a handful of men who bully and beat them until they nearly drop. No one is spared. The sick, the elderly, children, babies and pregnant women – all are marched to their death. We’re so fortunate here, away from the turmoil. We wouldn’t have to give a moment’s thought to this suffering if it weren’t for the fact that we’re so worried about those we hold dear, whom we can no longer help. I feel wicked sleeping in a warm bed, whilst somewhere out there my dearest friends are dropping from exhaustion or being knocked to the ground. I get frightened myself when I think of close friends who are now at the mercy of the cruellest monsters ever to stalk the earth. “I looked out of the open window, letting my eyes roam over a large part of Amsterdam, over the rooftops and on to the horizon, a strip of blue so pale it was almost invisible. The best remedy for those who are frightened, lonely or unhappy is to go outside; somewhere they can be alone, alone with the sky, nature and God. For then and only then can you feel that everything is as it should be and that God wants people to be happy amid nature’s beauty and simplicity. As long as this exists, and that should be for ever, I know that there will be solace for every sorrow, whatever the circumstances. I firmly believe that nature can bring comfort to all who suffer. “Mr Bolkestein, the Cabinet Minister, speaking on the Dutch broadcast from London, said that after the war a collection would be made of diaries and letters dealing with the war. Of course, everyone pounced on m diary. Just imagine how interesting it would be if I were to publish a novel about the Secret Annexe. The title alone would make people think I was a detective story. Seriously, though, ten years after the war people would find it very amusing to read how we lived, what we ate and what we talked about as Jews in hiding. Although I tell you a great deal about our lives, you still know very little about us. How frightened the women are during air raids…or how many epidemics are raging here.